I pulled out the crock pot, threw in the frozen pork roast, dumped in some homemade Italian dressing (recipe here) and turned it on high. A few hours later, the pork was tender, juicy and falling apart. Once it was ready, I simply warmed up the pita bread, made a simple Tzatziki sauce, chopped up some veggies, sautéed an onion and some peppers and dinner was complete. It was healthy and tasty, plus it took hardly any time at all. Chicken would also work well and be even healthier. Whatever meat you use, just throw it in the crock-pot and then you’ll know “What’s for Dinner Tonight?”. Place frozen roast or chicken breasts in crock-pot. Cook on high for 3-4 hours. Roast may take a little longer due to thickness; chicken breasts may take less time. Either way, you want the meat to be falling apart and tender. Chop tomatoes, grate carrots (I use pre-grated from the grocery store), shred lettuce, and grate cheese. Put in small bowels for serving. Slice purple onion and red pepper. Sauté on medium heat in a little oil, salt and pepper until soft. 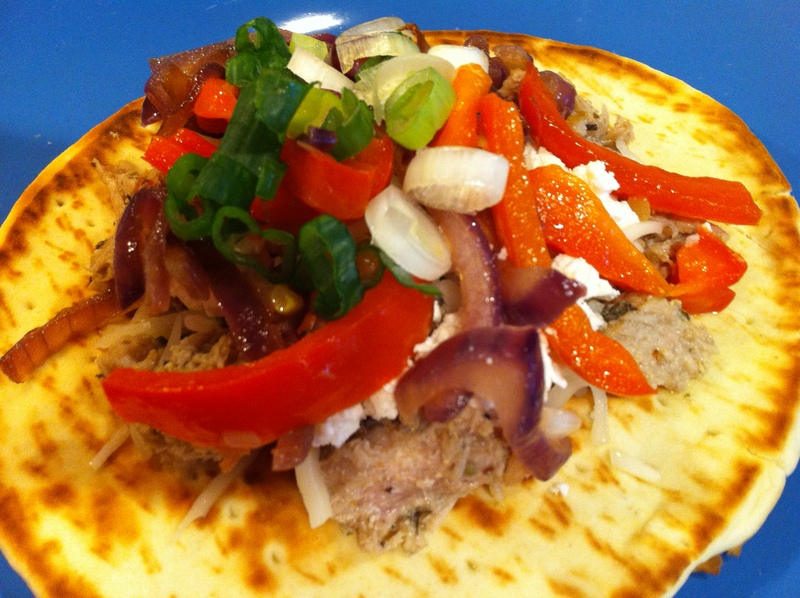 Warm up the pita bread, make the Tzatziki sauce, open some humus and dinner is served! Personally, I’ve never strained mine and I don’t use a recipe. I just throw some plain or Greek yogurt in a bowl, add some chopped garlic, chopped purple onion, grated cucumber, a squeeze of lemon, some dried dill, salt and pepper to taste and I’m done. But I do like the recipe above…the addition of olive oil, white pepper, vinegar, sour cream and fresh dill sounds really good. Whatever you decide, I hope you enjoy this simple dinner! TOTALLY cooking this tonight! Thank you for the wonderful idea. After 27 years, I’m tired of thinking up stuff to cook. Seriously. But I love cooking and just need refreshing ideas. Thank you! This is similar to my Peter (and Ben and Daniel’s) favorite German/Turkish street vendor food sold in Germany called a “Doner”. It’s similar to a Gyro or even a Schwarma, but is unique to Germany, having been created by Turkish immigrants.